I saw the original 1987 Oliver Stone film not that long ago, and it really is a well constructed drama. Now, Stone and star Michael Douglas have reteamed for the sequel. Unlike long delayed sequels these days, this holds promise. The first film revelled in ’80s excess, while Money Never Sleeps will hopefully take the same tact with the current global financial crisis. It opens on April 23. I’ve never been a huge fan of AC/DC, but director Jon Favreau’s decision to use their Back in Black song on the first film 2 years ago set helped establish the bold playful mood, and distinguish it from other more serious superhero movies. The team from the film and the Aussie rockers are reuniting for May’s sequel and below is the brand new music video, which shows clips of Iron Man 2, but nothing too exciting except a bunch of dancing girls from the film’s Stark Expo. Well I guess that’s mildly exciting. Press release and track listing for the IM2 soundtrack under the clip. Through a unique collaboration between Marvel Studios and Columbia Records, AC/DC’s music will be featured in Marvel Studios’ “IRON MAN 2,” the sequel to the 2008 blockbuster film. In addition, Columbia Records will release the album AC/DC: Iron Man 2 on Monday, April 19, 2010. AC/DC: Iron Man 2, features 15 classic AC/DC songs selected from ten of the band’s studio albums, ranging from 1976 to 2008. The complete track listing can be found below. The film opens internationally beginning on April 28, 2010 and in the U.S. the film is scheduled for release on May 7, 2010. The debut video from AC/DC: Iron Man 2 is the AC/DC’s classic album cut “Shoot To Thrill,” which was filmed live last month in Buenos Aires during the band’s highly acclaimed Black Ice World Tour, the second highest grossing world tour of 2009 according to concert industry trade publication Pollstar. The video also incorporates exclusive footage from “IRON MAN 2” and debuts today worldwide. Check www.acdc.com and www.marvel.com for more information. “Shoot To Thrill” was originally recorded for the band’s 50-million selling album Back In Black, one of the best selling albums of all time. Jon Favreau returns to direct “IRON MAN 2,” with Robert Downey Jr. reprising his starring role as the larger-than-life leading character, along with Gwyneth Paltrow, Don Cheadle, Scarlett Johansson, Sam Rockwell, Mickey Rourke and Samuel L. Jackson. Based on Marvel’s iconic Super Hero, “IRON MAN 2” continues the story of 2008’s box office smash hit “IRON MAN,” which grossed nearly $600 million worldwide, and was the first feature film produced independently by Marvel Studios. “IRON MAN 2” is being produced by Marvel Studios’ President, Kevin Feige. Is this piece (from next month’s Blackest Night: The Flash #3) the best thing Scott Kolins has ever done? I would say yes. 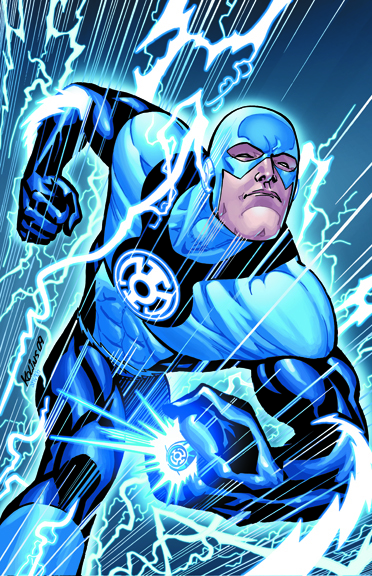 Though it’s not hard to make The Flash look dynamic, with lines and lightning everywhere, especially in his wonderful new Blue Lantern costume, but this is a great pic. I vaguely remember this animated film back in my youth, and being kinda weirded out by it! Now I can watch it again and see if it makes more sense. 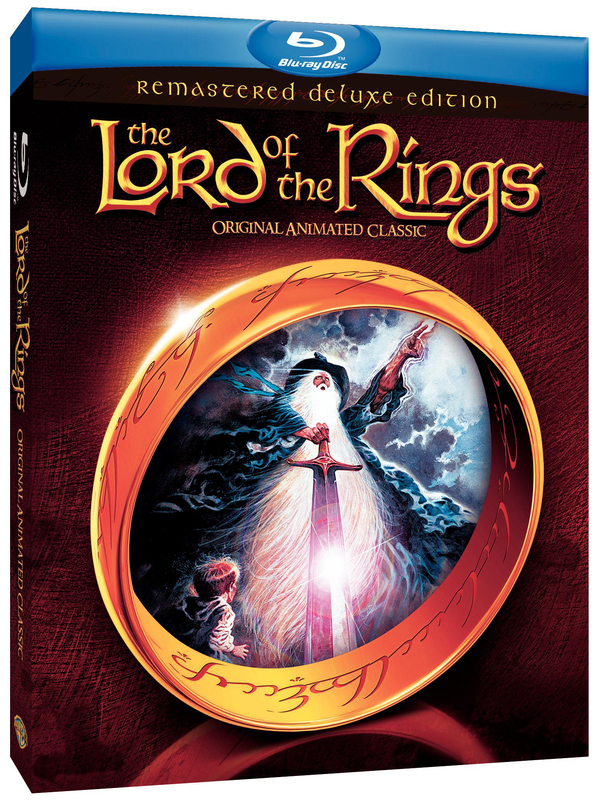 Rings Remastered Deluxe Edition coming April 6, 2010 from Warner Home Video. This original animated classic from acclaimed director Ralph Bakshi and Academy Award Winning producer, Saul Zaentz, has been remastered with pristine New Dolby 5.1 audio and picture quality and will be distributed as a single disc DVD and Blu-ray combo which features a Blu-ray, DVD and bonus digital copy. The film will also be available for Digital Download. This film is rated PG. title to the director’s canon of ground-breaking films. Bakshi’s animation accomplishments include Fritz the Cat, Heavy Traffic, American Pop, Wizards and Cool World. 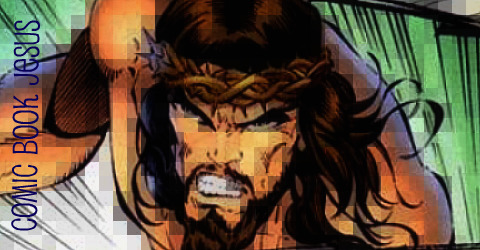 he defends his homeland from the Dark Power who would destroy it. Set in a mystical age of magic, monsters and unlikely heroes on incredible journeys, The Lord of the Rings will cast its spell over the entire family! Press release from Viz Media below about their new series launching next month. Cool cover. VIZ Media, LLC (VIZ Media), one of the entertainment industry’s most innovative and comprehensive publishing, animation and licensing companies, will debut the cyberpunk action manga series BIOMEGA on February 2nd. The new series, rated ‘M’ for Mature Audiences, will be published under the VIZ Signature imprint and will carry a MSRP of $12.99 U.S. / $16.99 CAN. Zoichi Kanoe plunges into the depths of 9JO, a sprawling island city in the middle of the Pacific Ocean, in search of Eon Green, a girl with the power to transmute the N5S virus. The deadly contagion is spreading across the world, turning humans into disfigured, zombie-like “drones.” But he’s not the only one looking for her. Agents of the Public Health Service’s Compulsory Execution Unit are also in hot pursuit, with sinister designs of their own. Zoichi and his trans-human allies have no time to waste; the countdown to the apocalypse has begun! 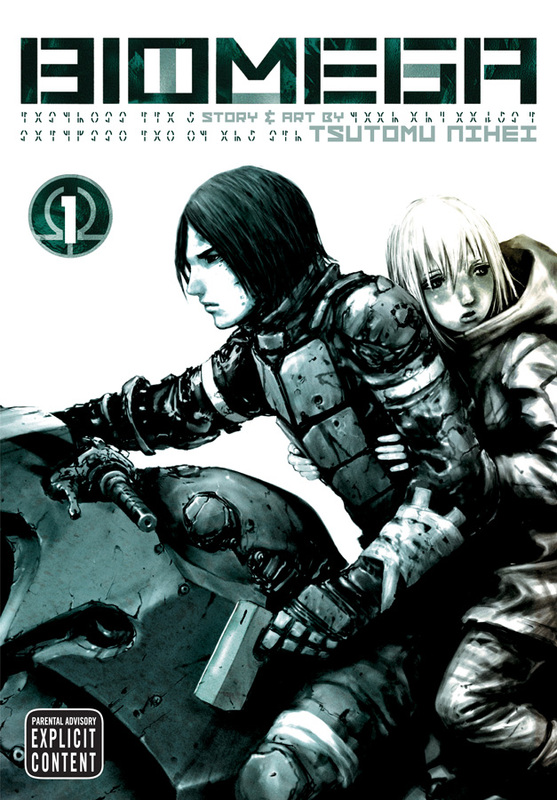 Tsutomu Nihei debuted with the acclaimed manga short story BLAME!, which was nominated for North America’s Harvey Award and won the Shiki Award in Japan. The artist also created NOiSE, a manga prequel to BLAME!. His visually striking Wolverine tie-in SNIKT! was published by Marvel Comics along with a commission by Bungie Studios for the HALO graphic novel. For more information on this title, or others from VIZ Media, please visit www.viz.com. Samuel L. Jackson Goes BOOM! BOOM! Studios are doing the Marvel thing and releasing a teaser image, with no text. 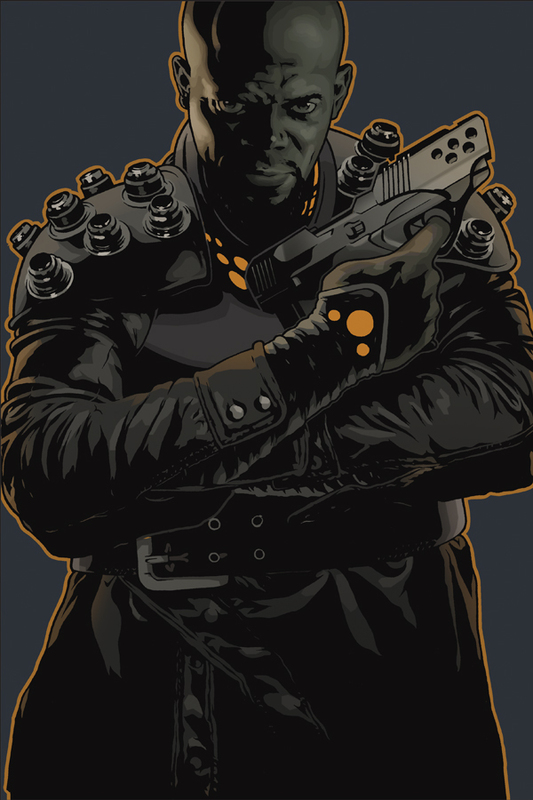 Here’s their lone picture of Samuel L. Jackson, but eagle eyed fans have noticed that it’s in relation to a new series called Cold Space, as seen in the April solicitations. From legendary actor Samuel L. Jackson and Emmy nominated writer/producer Eric Calderon, the team that brought you the Emmy-award-winning, best-selling Afro Samurai, comes their next original series — Cold Space! When an on-the-run outlaw crash-lands on a hostile planet on the brink of civil war, he finds himself caught in the crossfire between two warring factions. But in chaos lies opportunity… because where there’s war, there’s money to be made! A hard-boiled sci-fi action-adventure with covers by Eisner Award-winning artist Dave Johnson and Irredeemable cover artist, Jeffrey Spokes! May 1 is the annual Free Comic Book Day event, to promote the diversity of our beloved medium. For that day only anyone is welcome to garb selected titles from participating FCBD retailers. Asylum Press have now released a preview of their FCBD one-shot right here. You can take a look at Fearless Dawn, Warlash and previews of upcoming books. If you like cheeky humour and horror, it’s definitely for you. Frank Forte, publisher of Asylum Press, has announced the release of a preview Fearless Dawn/Asylum Sampler FCBD issue. A great way to introduce Asylum Press to retailers and fans. 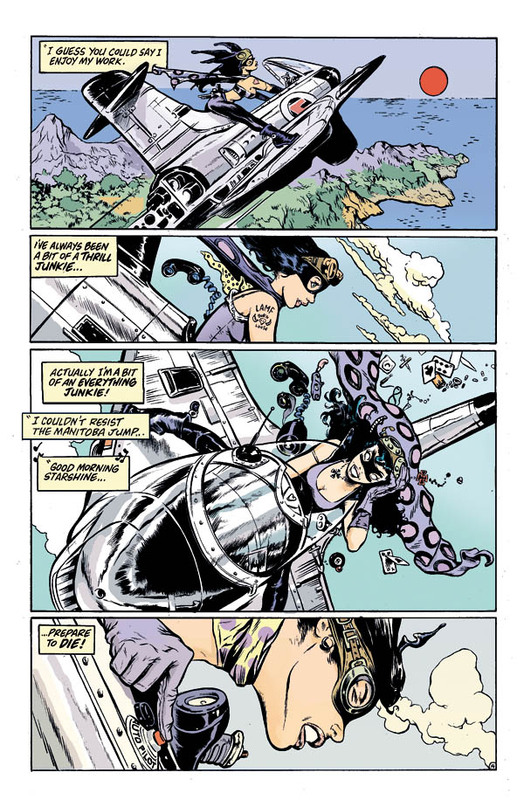 Featuring a sampling on new and upcoming comics. Fearless Dawn By Steve Mannion features our favorite new heroine battling a troop of mutants. Black Powder, a bloody frontier adventure, by Dwayne Harris, can be described as a “Buckskin Apocalypse Now”. Warlash:Origins features a tale of Bladeviper by Royal McGraw and J.C. Wong. Farmhouse is a tale of a drifter who falls in love with an artist undergoing an experimental art therapy regimen, by Elizabeth J. Musgrave and Szymon Kudranski. In Warlash: Zombie Mutant Genesis, our armored hero goes up against a horde of brain eating monsters, by Frank Forte. EEEK! by Jason Paulos, is an anthology of retro style horror tales.